Need a bigger feeder? Try Madagascar Hissing Cockroaches! 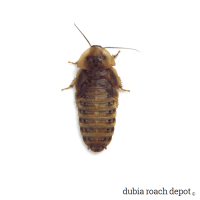 They make great supplements to Dubia for larger animals, or primary feeders for animals that have outgrown Dubia roaches entirely. We anticipate having these available sometime around June. To get an email when they're in stock, try adding to cart, then sign up for in-stock notification. The Madagascar hissing cockroach (Gromphadorhina portentosa), also known as the hissing cockroach or simply “hisser”, is among the largest cockroach species in the world. It reaches a length of 3 inches or more at maturity. Its unusual size and generous protein content make it an excellent feeder for large insectivorous reptiles and other similarly proportioned animals. Naturally, you can dust and gut load Madagascar hissing cockroaches like any other omnivorous feeder insect, and lots of animals love them. While hissing cockroaches may sound menacing, their bark is worse than their bite…in that they do not bite at all and won’t harm you or your animals. They are actually very docile insects. Madagascar hissing cockroaches are not particularly fast-moving as roaches go, and they have largely lost the fear of humans. Individual specimens are often “tame” right from the start, while those that aren’t can usually be calmed in short order with regular handling. We raise all of our Hissers in the same way as our other roaches, which means we feed them fresh fruits and vegetables and our thoroughly researched roach chow. Feeding Madagascar hissing cockroaches to insectivorous animals is straightforward. There are no special rules or requirements, and our only advice is to feed them one at a time because they are accomplished escape artists. You can read more about their expert climbing abilities below. 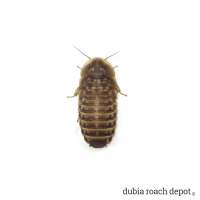 With respect to feeding and volume, one large Madagascar hissing cockroach is roughly equal to four or five extra-large Dubia roaches. Breeding Madagascar hissers is easy too, although they are slow to reproduce. Just keep them in a dark place around 80 degrees F and feed them fruits, vegetables, and perhaps some meatless chow. We suggest avoiding dog and cat food because their quality is often questionable. What your roaches eat eventually ends up in your pets, so be cautious. 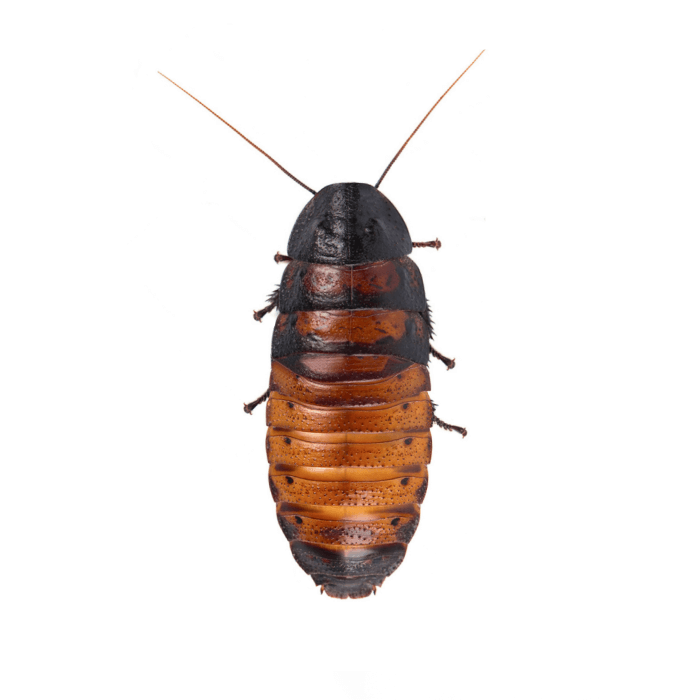 Cockroaches are scavengers and will eat almost anything, so we suggest being selective with their feeding. If you don’t exercise restraint, no one will. The roaches themselves certainly won’t. Before you buy Madagascar hissing cockroaches, be sure you can house them. They can climb any surface, including glass, and you will need something that can hold them. This means either a container sealed with a tight-fitting lid or a bin lined with a 2 inch strip of petroleum jelly or silicone grease along the inner walls. Either method works to prevent most escapes. We’ve seen a few tiny ¼-inch nymphs manage to get out, but never adults. Consider that housing feeders doesn’t require fancy containers. In this case, you only need to hold them until they’re fed off. However, if you plan on breeding Madagascar hissing cockroaches, you will need something a bit more accommodating. The bottom line is that Madagascar hissing cockroaches make great feeders. If your animal has outgrown Dubia roaches or you’re just looking for a supplemental feeder, consider giving Madagascar hissers a try! NOTE: We sell these roaches as feeders and they are not sexed. 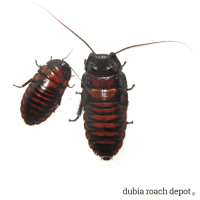 These are the highest quality Roaches I have seen anywhere, including online and reptile shows. Prices and service are very good too. Highly recommended! !